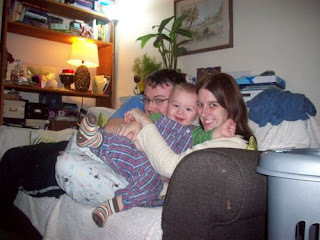 Hi, I'm Amanda and I'm wife to TJ and mummy to Little Man (born September 2011). I suffered from severe pregnancy sickness, possibly undiagnosed Hyperemesis Gravidarum (based upon indicators such as weight loss of more than 10% of my pre-pregnancy weight, dehydration, inability to function etc) whilst pregnant with Little Man and it has had a massive impact on my entire family. As such I am passionate about raising awareness of this condition and supporting women and their families who are going through the same thing. Like many women I had to fight for treatment and deal with a lot of ignorance regarding just what I was experiencing. I truly hope that one day (soon) this will change! This is why I volunteer as much of my time as possible to help the charity Pregnancy Sickness Support. The charity is small but has so much to give and so it relies heavily on both volunteers and donations. And so I am proud to be part of this current fundraising campaign, doing something for 9 months to raise awareness and funds. Due to other health issues I am unable to take on a physical challenge, so I decided to spend my 9 months crocheting. Although crochet is a hobby I enjoy anyway, I rarely sit down every single day to work on a project and so challenging myself to find at least 10 minutes every day to work on something means I shall hopefully have completed several items by the end of the 9 months. At the time of writing this I am in my second week (I started a bit early) and have almost completed a hat and bag. I taught myself to crochet in 2006, the year before I met my husband, but it wasn't until my pregnancy in 2011 that I really got to grips with the mechanics of pattern design and a variety of stitches. In the early weeks of my pregnancy I couldn't do anything, but gradually I became able to drag myself downstairs and into the garden to sit for an hour or two and work on a blanket for my baby. At that point it was very much a distraction technique to try and ignore how sick I felt. Concentrating was difficult however and I didn't make much progress. I received treatment that helped in the 5th month of my pregnancy and suddenly I was able to function pretty normally as long as I didn't overdo it. I sat and crocheted many items including 2 more blankets, several hats, and even a selection of crocheted crowns for my niece's "Princes and Princesses" birthday party. So crochet will always remind me of those "happier times" in my pregnancy and how important adequate treatment is. I have added my name to the fundraising team in case anyone wishes to sponsor me, however my main aim is to raise money from selling the items I make. Every single item completed during this challenge will be put up for auction on eBay in May 2014 to coincide with International Hyperemesis Gravidarum Awareness Day. 100% of the total price of each item sold will go direct to Pregnancy Sickness Support. I ran a handmade auction this year with items donated from other crafters and raised just over £300... I hope to at least match that next year with the items I make! I shall be providing updates on here throughout the nine months, however there will be more regular updates being made on my own personal blog. I also have a Pinterest board dedicated to inspiration for this challenge, and am getting a lot of my patterns from Ravelry.